Welcome to the wonderful and exciting world of Garnacha/Grenache, one of the oldest and most widely planted wine grapes in the world! If you feel unfamiliar with the wines it produces, no worries! The truth is that you have most likely experienced one (or many) already! While most people know Garnacha/Grenache for playing a role in GSM blends, a new generation of winemakers in Europe, and particularly in its birthplace of Eastern Spain and Roussillon, is crafting innovative wines in which the grape plays the starring role. A sip of these new wines is enough to understand European quality Garnacha/Grenache’s ability to deliver complex, structured and well-balanced wines. 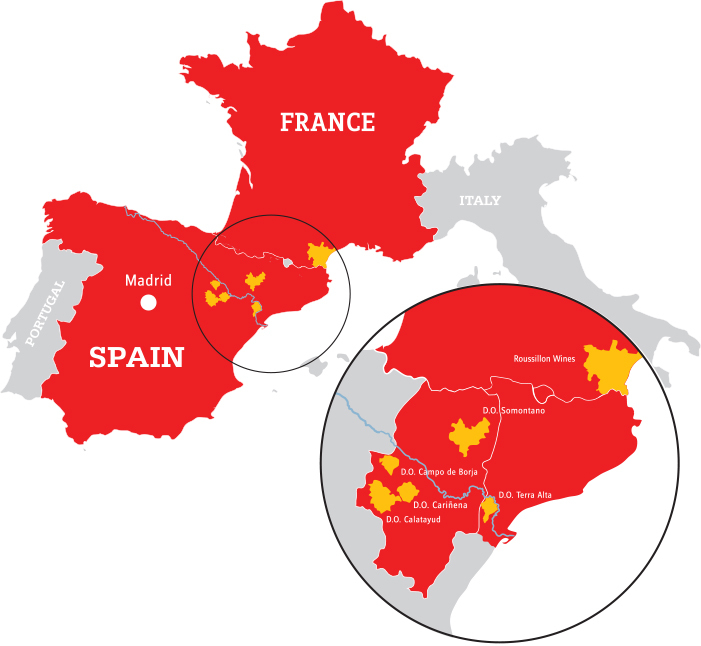 While Garnacha/Grenache is now one of the most widely planted grapes in the world, its origin go back to Europe in the region of what is now eastern Spain / southern France. Thriving in the hot, dry Mediterranean climate, the varietal soon spread to the south and east, first to Catalonia and then to other places where the Crown of Aragón expanded throughout the 12th-17th centuries (Corsica, Sardinia, southern Italy, Sicily, Croatia and even Greece). Producing a good single varietal Garnacha/Grenache wine isn’t less of a challenge and you have to be careful and follow some specific rules! While it is not a difficult grape to grow, Garnacha / Grenache is highly sensitive to variations in terroir and requires specific conditions and care to produce its best wines. In some places – such as Chateauneuf du Pape – the varietal has historically been blended with other grapes so it can add its ripe, aromatic and fruity aromas to other grapes with more tannins or color.